Start winning big with our generous welcome bonus at Euro Dice Stars! Subject: Start winning big with our generous welcome bonus at Euro Dice Stars! Get in on the action at EuroDice Stars with an impressive welcome bonus of 300%. 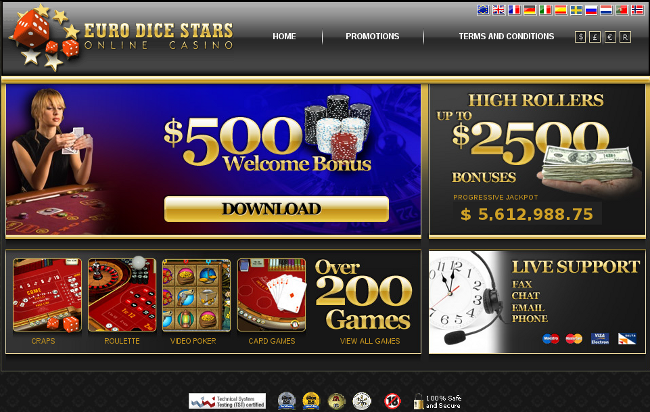 Euro Dice Stars Casino has a whole range of excellent games. Deposit 100 Euro and play with 400 Euro. With loads of money to be won and an excellent operating system you just a click away from your first million! We are really sick of these spam e-mails and the only way to stop Euro Dice Casino spam from reaching your inbox, is by using an effective spam filter like MailWasher Pro. The spamvertised websites operate in the same way as the Reel Vegas/Royal Vegas and Seven Stars/Seven Sultans casino spam examples. The website is mainly a portal for the online gambling software. In this case you need download a file called SetupClibdice_2156e.exe in order to play online. We haven't tested the file for malware yet, but you can never trust anything downloaded from a spamvertised website. Only two main websites are associated with this spam namely starseurodice.com and istarseurodice.com and both are hosted on Russian servers (which shouldn't come as a surprise). The link in the spam e-mail always points to a domain containing the phrase eudice or eurodice. Most of the sites are .pl but some are .net and .com. It is also noticeable that the spammers use different servers for the same domains (most probably to prevent one server from being overloaded, because they send out a lot of spam e-mails on a daily basis). For example you would get one spam e-mail pointing to wwwt.igreattopeudice.pl and another one pointing to wwwo.igreattopeudice.pl. At the same time the spammers are mixing up the text in the spam e-mail while pointing to the same site.